Description: The Olympus upright light microscope is a research-quality microscope with brightfield, phase contrast, DIC, polarized light, and widefield fluorescence capabilities. The Olympus BX51 is equipped with a DP72 digital microscope camera and DP2-BSW image acquisition software. Currently setup in a classroom and connected to a projector, this system will enhance in-class discussion for teaching and outreach. 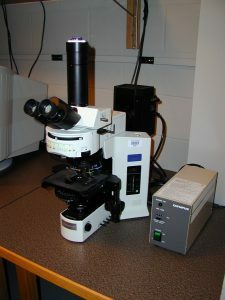 Training consists of hands-on microscope instruction. Brochure: Click here for PDF. For new users, use the Training Request form. For registered users, use the Online Scheduler.